Transform the look of your home's floor with the Toasted Spalted Maple 8 mm Thick x 5 in. Wide x 7 in. Length Laminate Flooring. Featuring tap-lock joint technology, this beautiful flooring installs easily over your existing floor for quick assembly. The light color and smooth texture offer a stunning appearance. This flooring is compatible with radiant heating applications for versatile installation. 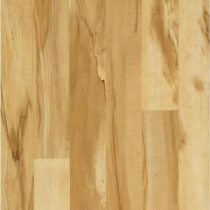 Buy online Hampton Bay Toasted Spalted Maple Laminate Flooring - 5 in. x 7 in. Take Home Sample HB-011343, leave review and share Your friends.